Alta Supercharger Pulleys - Dezod Motorsports Inc - Home of the automotive performance enthusiast since 2002. While MINI may have given Cooper “S” owners a literal boost over standard Coopers there is no reason to be comfortable with 163HP. One of the best ways to turn up the power is to turn up the boost. This rise in boost pressure will increase HP 12-20! No other modifications to ECU etc., required. Customers with other existing modifications or those seeking more HP the results can be even better with the addition of ECU, intake, intercooler and exhaust! 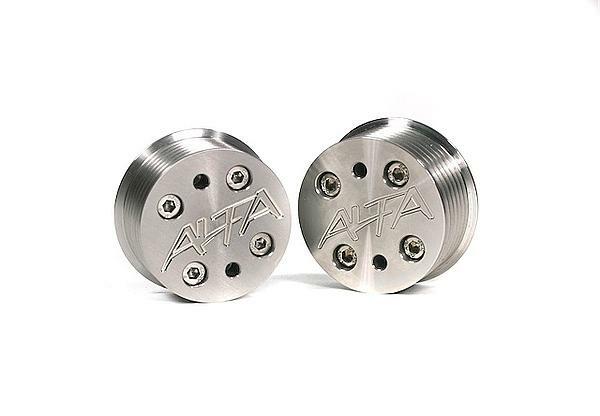 NOTE: ALTA also offers stock sized Supercharger Pulleys and for custom SC applications and Twurbo Kit customers ALTA offers an Oversized Supercharger Pulley to lower boost pressure on the factory supercharger.